Place in a food processor with a blade, or a blender and process until blended. The basil will be evident, and not pureed. 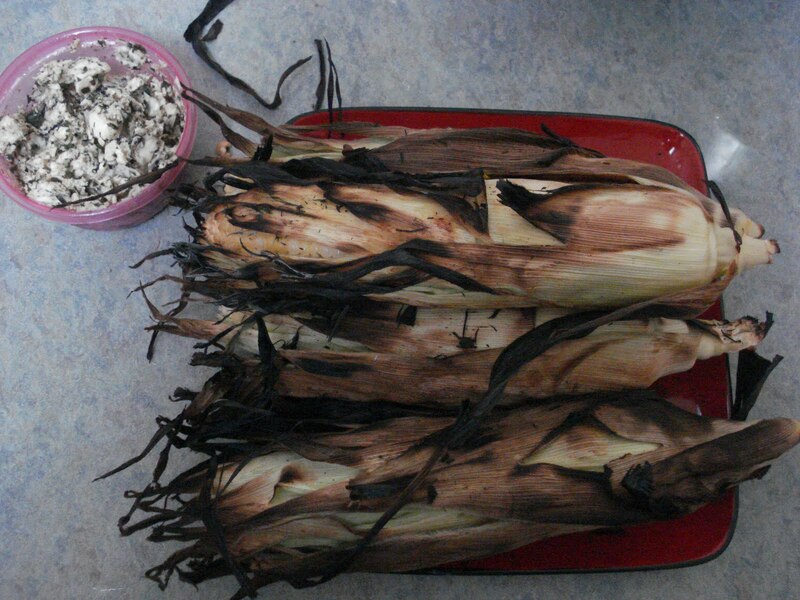 Peel back the corn husks right down to the kernels. Be careful not to rip the husks off; leave attached. Remove the silk, and fold the husks back up. Soak whole ears in water for 3 minutes turning to make certain the water is all the way to the cob. Fire up the grill to cook whatever meat or other vegetables that you are planning on having. Place the corn directly onto the grill and cook for a total of 12 minutes, turning often. Should the husks start to burn, spray with water. Remove from grill. Let sit for 3 minutes. Remove the husks. Serve with the basil butter. Use basil butter generously, as remember, 1/2 of this is basil! Happy grilling! Enjoy the summer while it is here, and especially the corn!